A Birmingham school has welcomed nearly 1,000 teachers from across the Midlands through its doors to watch a series of live maths lessons led by two expert teachers from China aimed at transforming the way maths is taught in UK primary schools. 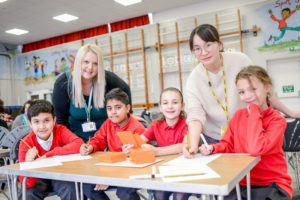 Cedars Academy in Acocks Green, Birmingham, hosted two weeks of open lessons taught by visiting maths teachers, Crystal Liu and Ming Huang, to their pupils aged between 7 and 11 as part of an international education exchange programme. Crystal and Ming, from Shanghai, showcased the ‘mastery’ approach which has helped China establish itself as a world leader in maths studies by helping children developing a deep, secure and fluent understanding of mathematical concepts and the ability to apply their knowledge to a variety of practical problems. The visit, organised alongside the Central Maths Hub and the National Centre for Excellence in the Teaching of Mathematics (NCETM), saw around 100 teachers a day visit Cedars Academy to observe the lessons. Faye Glendinning, Strategic Leader for Maths at Cedars Academy, visited Shanghai in December to learn more about the mastery approach before welcoming Crystal and Ming back to Birmingham. Faye said: “The response to the showcase lessons has been incredible. They have helped to create a meaningful dialogue between teachers from all over the region which will have an impact on how our children are taught maths in the future. Our children have been fantastic and have really taken to Crystal and Ming with enthusiasm and showing our school in a really positive light to all of our visitors. Previous ‘Bowled over’ with GERFLOR!